Each electronic key can be registered to recall your preferred driving position. Record your driving position to button �1� or �2� before performing the following: carry only the key you want to register, and then close the driver�s door. If 2 or more keys are in the vehicle, the driving position cannot be recorded properly. Recall the driving position that you want to record. While pressing the recalled button, press and hold the door lock switch (either lock or unlock) until the buzzer sounds. If the button could not be registered, the buzzer sounds continuously for approximately 3 seconds. Carry the electronic key that has been registered to the driving position, and then unlock and open the driver�s door using the smart key system or wireless remote control. The driving position will move to the recorded position. If the driving position is in a position that has already been recorded, the seat and outside rear view mirrors will not move. Carry only the key you want to cancel and then close the driver�s door. If 2 or more keys are in the vehicle, the driving position cannot be canceled properly. While pressing the �set� button, press and hold the door lock switch (either lock or unlock) until the buzzer sounds twice. If the button could not be canceled, the buzzer sounds continuously for approximately 3 seconds. 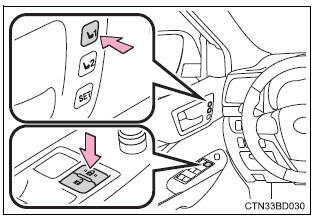 different driving positions can be registered for each electronic key. Therefore, the driving position that is recalled may be different depending on the key being carried. If a door other than the driver's door is unlocked with the smart key system, the driving position cannot be recalled. In this case, press the driving position button which has been set. The unlock door settings of the memory recall function can be customized. Take care during seat adjustment so that the seat does not strike the rear passenger or squeeze your body against the steering wheel.